Ariana, or Ani, was born a perfectly normal and healthy little girl. All that changed on Friday, January 13, 2006. Little Ani was diagnosed with a rare form of childhood brain cancer – pontine brain stem glioma. This form of cancer accounts for less than ten percent of all childhood brain tumors. The prognosis is not good. The tumor intertwines itself with the vital parts of the brain stem and in most, if not all cases, is inoperable. The oncologist at Presbyterian Hospital in Charlotte, N.C., referred Ani’s parents to Dr. Nicolas Foreman at Children’s Hospital in Denver, Colorado. The decision was then made to move Ani’s family to Denver, and their lifestyle changed in a matter of days. Ani endured months of radiation and steroid treatments. She felt sick and weak and lost some of her hair. Her body and face became radically swollen and unrecognizable. Six months after being diagnosed Ani was feeling, looking and acting normal. She had surgery to uncross her eyes and she felt, for a while, like a pretty, normal 4 year old girl again. She was dancing ballet and tap every Saturday morning and swimming with her brothers and cousins most other days. Though there was no conventional medicine or treatment known to prevent the re-growth of the tumor, the family relied on nutritional supplements and spiritual guidance. They all held out hope that SHE would be the one to beat it. Ten months after being diagnosed, the tremendously courageous battle Ani fought ended. She passed away on January 3rd, 2007. If asked what she came into this world to do, she would likely tell you “I came to live out loud”! and she did. 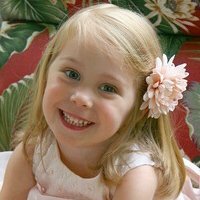 Ani was an amazing girl and in her short four years – lived with an abundance of love, laughter and joy and will forever be remembered.